One thing I have discovered about Facebook is that it can be a dangerous tool, especially to those of us who have constant appetites. For example, I was reading some comments on a friend’s wall and I saw a photo of a huge pot of what looked like gumbo. Well, I clicked on the photo and – lo and behold – when it opened to a larger photo, it was indeed a pot of gumbo. Needless to say, my food alarm went off and I was in a bit of a frenzy. Mind you, it was only a few hours past lunch and the photo had thrown me in a fit of hunger. This is what a food addiction has come to for me: anticipating 5:00 PM so that I can address my hankering. With my thoughts fixated on gumbo and me having a lengthy weak moment, I knew where I could go to satisfy my craving. It was not necessarily ethnic food from the standpoint of ethnically non-American. I could make an exception for some New Orleans Cajun cooking. Hey, if I’m going to indulge some good American ethnic food, it will be worthy of the trip to get to a restaurant or cafe that represents the best Southern style cooking to be found. So, at 5:00 PM, I was off to Dixie Kitchen & Bait Shop at 825 Church Street in Evanston, Illinois. I got a seat outside so that I could enjoy the nice weather and listen to a band that was playing a few blocks away at an outside plaza. 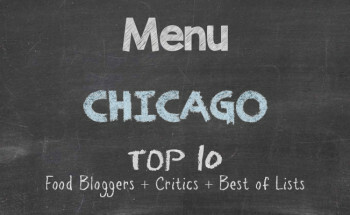 Having been to the Chicago Hyde Park location before it had closed, I had an idea of what I wanted. The server had a look of awe as I rattled off what I wanted. I started with complimentary Johnny cakes. Think small pancakes without syrup. 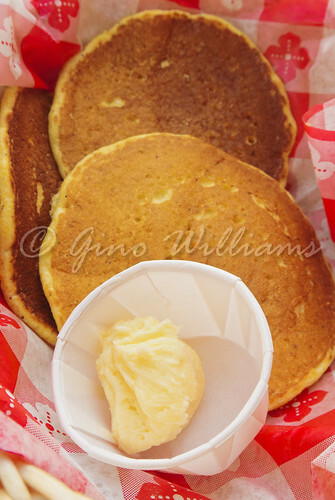 There was a dollop of honey butter that came with the cakes and that was all I needed to be transported back South. Then I had fried green tomatoes that came with shredded lettuce and chives. As a child, my grandmother used to fry green tomatoes. We would dash some hot sauce on those bad boys, sit back, and have a real go of. I did the same with the fried green tomatoes from Dixie Kitchen. 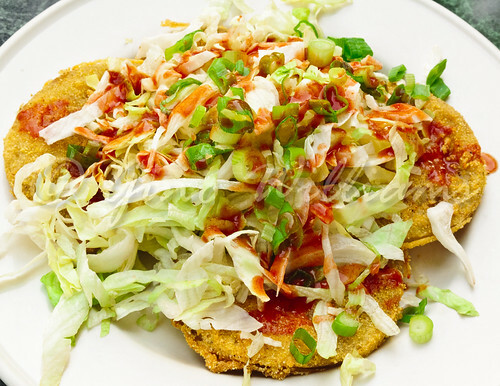 I will admit that adding the “salad” to the fried green tomatoes struck me as a bit of a “trying to be exotic” addition because fried green tomatoes can hold their own without extra accessories. I ate it all to completion anyway. The second course was a plate of crawfish and corn fritters prepared hush-puppy style, and served with a jalapeño jelly. The fritters looked like beignets and I bet that is what they were – filled with crawfish and corn. That was fine, though, as I found them to be well worth the sampling. The fritters are not stuffed to capacity with crawfish and corn, so be forewarned. 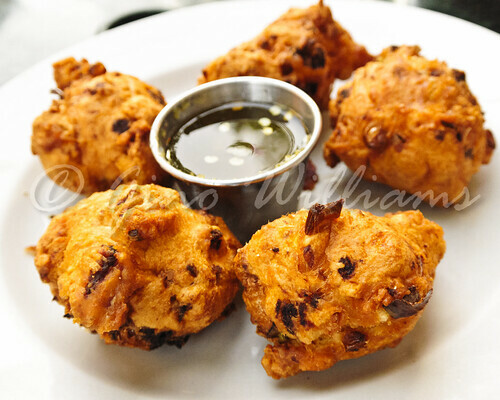 There is a fair amount of each ingredient in each fritter but you do not get a well-formed ball of crawfish and corn and a coating of crust that holds it all in place. Served with the jelly, it made for a combination that I think comes across as a perfect snack. And then came the reason that I had made Dixie Kitchen & Bait Shop my after-work destination. I had a cup of their gumbo. May we have a moment of silence? (Pause) I never know what to do with myself when I get a spoonful of Dixie Kitchen gumbo into my tummy. The gumbo at Dixie Kitchen is not prepared with a roux base the way it is in New Orleans, but it is prepared with a gravy base. The gravy may have its origins in a roux base so I shall concede a little. That’s fine because it tastes delicious just the same. 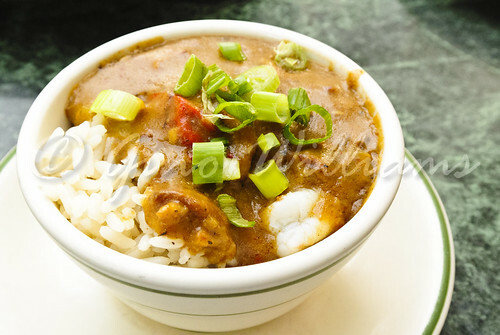 The cup of gumbo burst with shrimp, chicken, and andouille sausage over rice. Although I had long since taken pork out of my diet, there are some concessions that I will make all in the name of enjoying good food. I did not request to have the gumbo without the sausage. I wanted the full experience, as I have always enjoyed. I was satisfied. But I still had a little more room for something else. I had resigned myself to the notion that I was not going to indulge any dessert, so I ordered some étouffée. Unlike the appetizer size portions for the previously mentioned items, the étouffée was a full entrée That meant I had decided to eat an appetizer amount and get the rest for take-away. Again, there wasn’t the full New Orleans experience, but I am in Chicago. There are allowances. 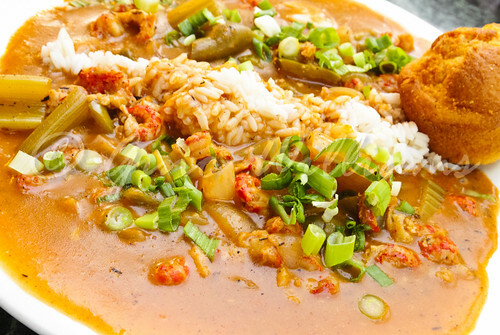 The étouffée was prepared with a roux base and full of crawfish, shrimp, onions, celery, and peppers. The flavour was there, not the spicy kick, though. It wasn’t until I stirred up the rice and the gravy more that there was a bit more seasoning to the dish than initially. Needless to say, I enjoyed the dining experience on location and had enough to take home for later food bliss. 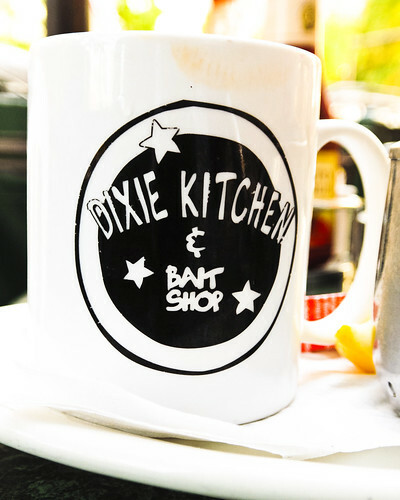 Dixie Kitchen & Bait Shop has that shack-on-the-bayou look about it. The Evanston location doesn’t present that look and feel as much as the location that used to reside in Chicago’s Hyde Park use to display. There may be some New Orleans traditional jazz or Zydeco music playing in the background. There are always filled bellies and chomping jaws on site. It may be that you’ll get fired if you have a nasty attitude because the service is always great. As far back as 1995, the quality of food, serve, and price has been consistently good. The food may not be exactly what you get when you go to New Orleans, but for a location so far removed from the South, it still keeps those like me who have been to New Orleans coming back. Comparing any other food to New Orleans cuisine is unfair because food in Southern Louisiana really explodes with a bloom that no one outside of New Orleans and the backwater sections of Louisiana can reproduce. In the meantime, I have made a mental note to myself to not click on any more thumbnail photos that look anything like it could be gumbo, étouffée, jambalaya, or any other kind of New Orleans cuisine. Food addictions consume your thoughts so full and complete.